Happy new year everyone. I was pondering on the issue of 'new years resolutions' and whether I was going to make any. Sometimes I think that by making them, we set ourselves up to fail because of the pressure of trying to keep them. 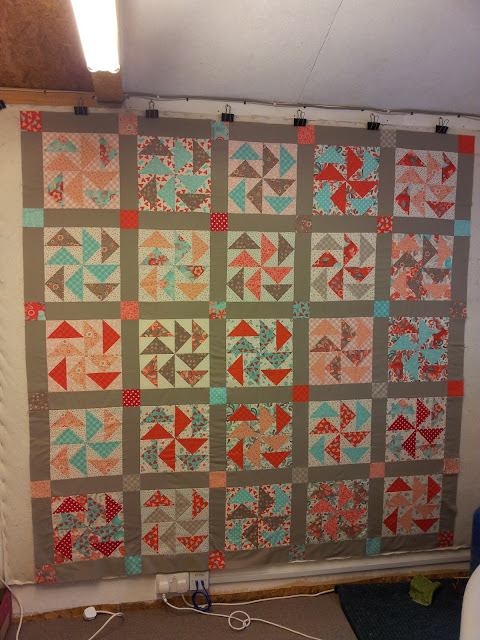 I have known for ages that I am a good starter and a poor finisher when it comes to quilting (one look at my pile of UFO's will vouch for that!!!) I see a pattern I want to make and start off with lots of enthusiasm then get sidetracked by another pattern or just pressure of work, and I go off the boil and lose interest. I thought I may post pictures of all my UFO's and then say I would complete them all before starting something new......then I got real!! It was never going to happen. One or two I have decided that I do still like and will TRY and finish them this year. I will post them as soon as they are done. 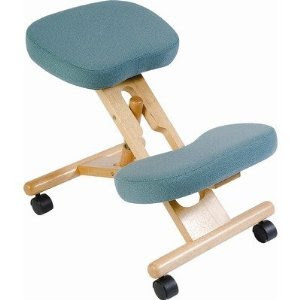 This first one is for Jenny. 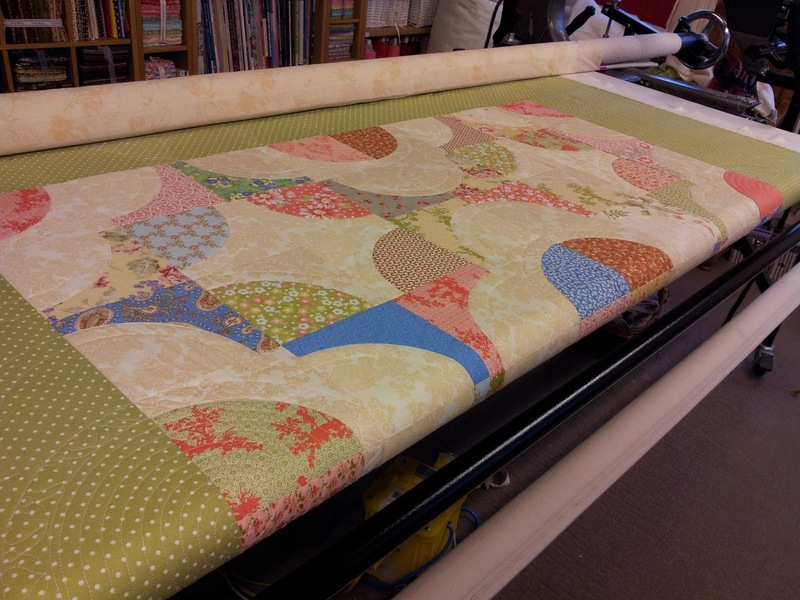 She was given the top, wadding and backing by another quilter (who probably, like me, had gone off the boil!!) so she decided to finish it as a sofa throw. 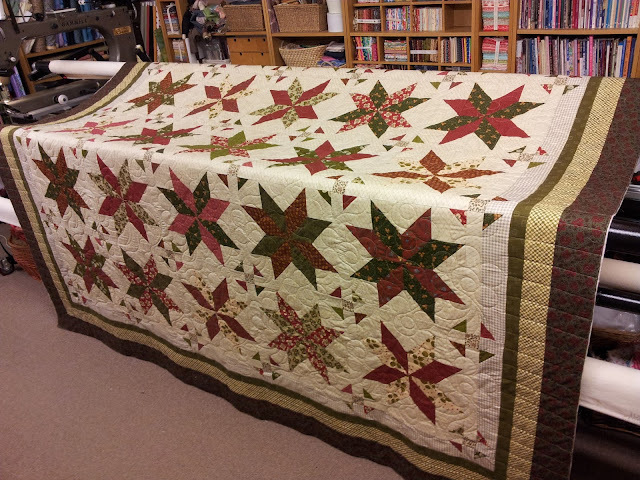 It is rather like a braid quilt and I quilted it with an allover pattern called 'Asian leaves. 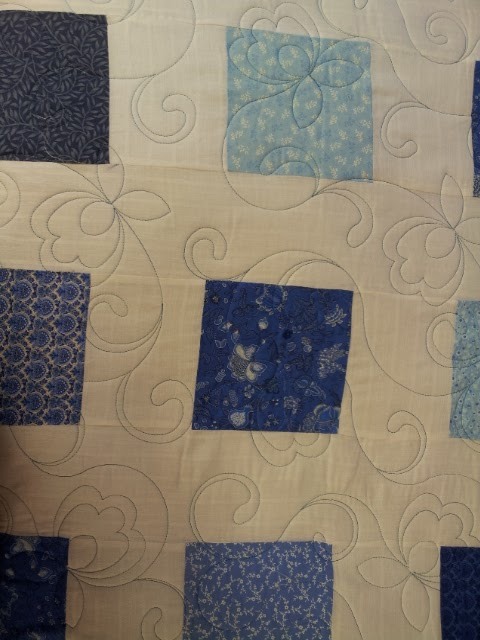 This quilt was made by Jean and although the block is a simple square, all the white areas really show up the quilting. 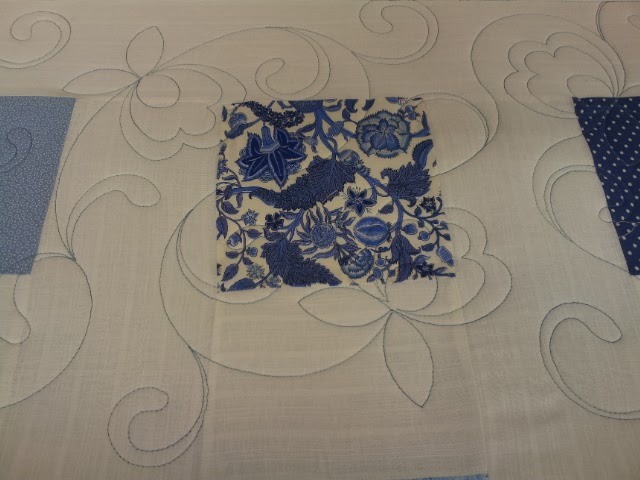 I did 'pretty posies' by Tammy Finkler on it and as Jean wanted a blue thread, it really shows the qulting nicely. 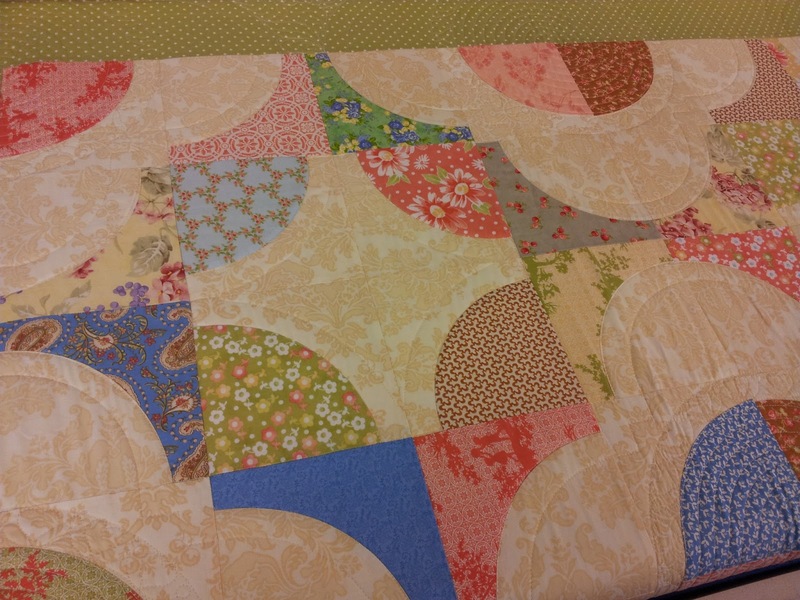 This was Julie's quilt and she chose 'circleplay' because she had used loads of dotty fabrics - Mmm, I love dotty fabrics! Anna made this quilt and I stitched a daisy pattern called 'flowers for Lynda' in a yellow thread which shows up nicely on the back. 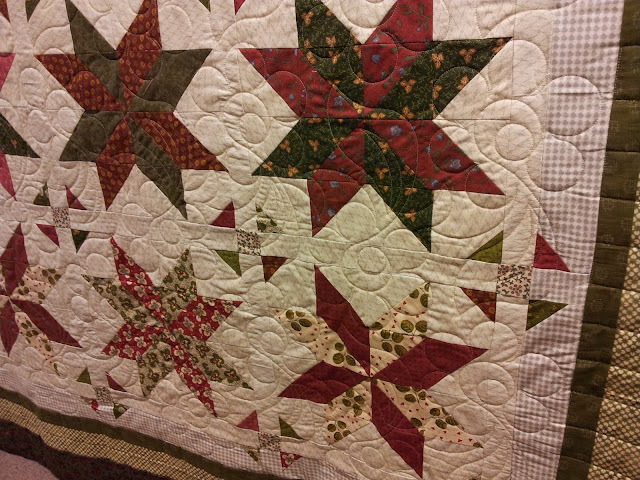 Christine made this quilt and I quilted a simpler version of 'pretty posies'. I decided to call it a day when I had 6 blocks. I added borders, and once I have quilted it I will make another one using a smaller block. I started to quilt it but have taken if off the machine so I can do some work. I will reload it once I have some time and will post pictures once it is finished. I started to piece a new quilt using some 'Flirt' fabric by Sandy Gervais. I bought this by mistake!! - I'm not usually into heart fabrics but decided to use it nonetheless. I suppose it is quite relevant as Valentines day is approaching. I found this great website - http://www.patchpieces.com/files/flyinggeese.pdf - that shows you how to make the flying geese with no waste. I chose to make a 12 inch block. I know this method of making flying geese is not new but it was good to know the maths to make a block any size you want. I am just deciding whether to leave it as it is or add a plain 'bella stone' border - what do you think? 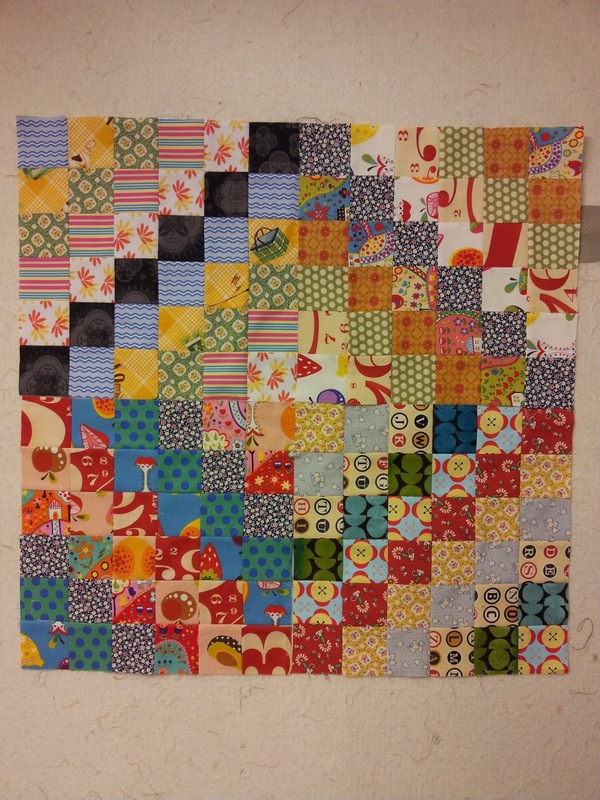 I've got lots of strips cut out so will continue to make blocks. And finally - We've had snow!! The view to my studio this morning as I set out to work! It wasn't even properly light but I thought it looked pretty with the garden lights on. 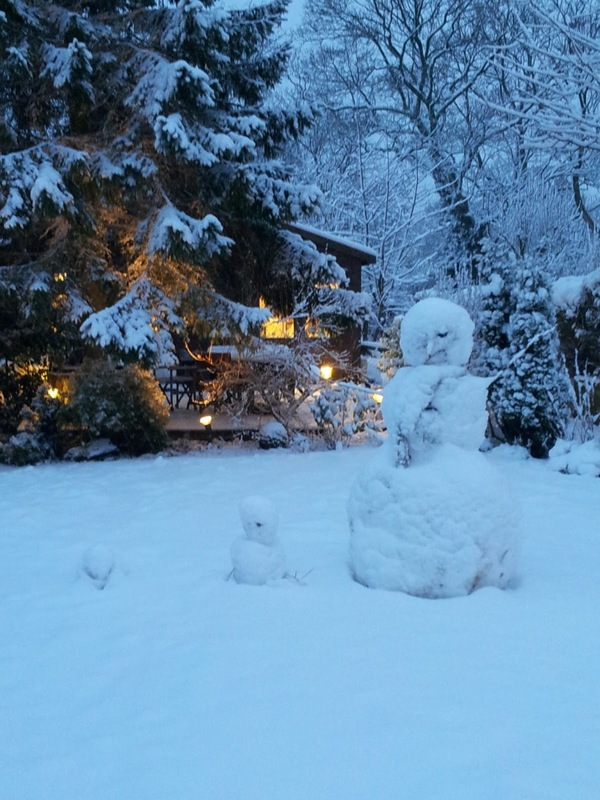 The snowman, his baby and dog got a fresh covering! 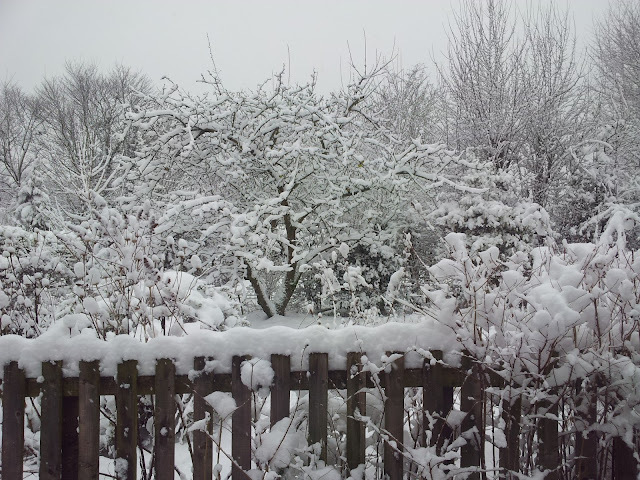 The view out of my studio window - so pretty. Hope you are all home, safe and warm with some quilty projects on the go.